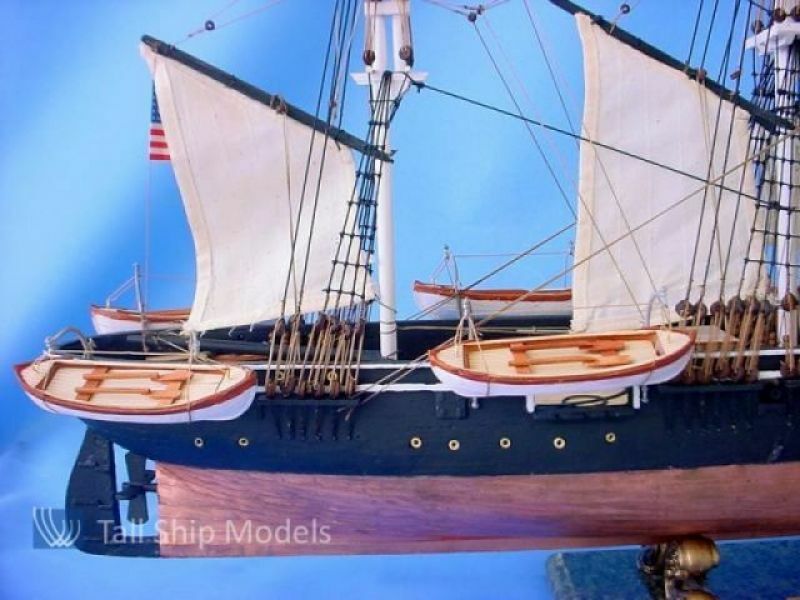 USS Kearsarge Limited Civil Warship Model 35"
These model tall ships scale Civil War replicas of the early propeller-driven steamship USS Kearsarge are a Limited Edition defined by museum-quality features and finely-crafted details. 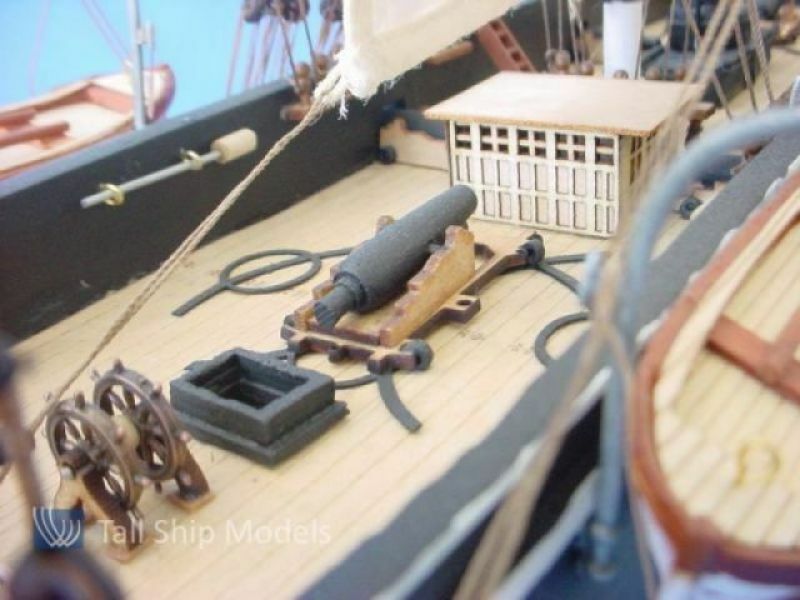 Great effort and devoted attention to historical accuracy ensures that every detail on this warship matches her as she sailed the Atlantic and fought Confederate raider the CSS Alabama in their famous engagement. 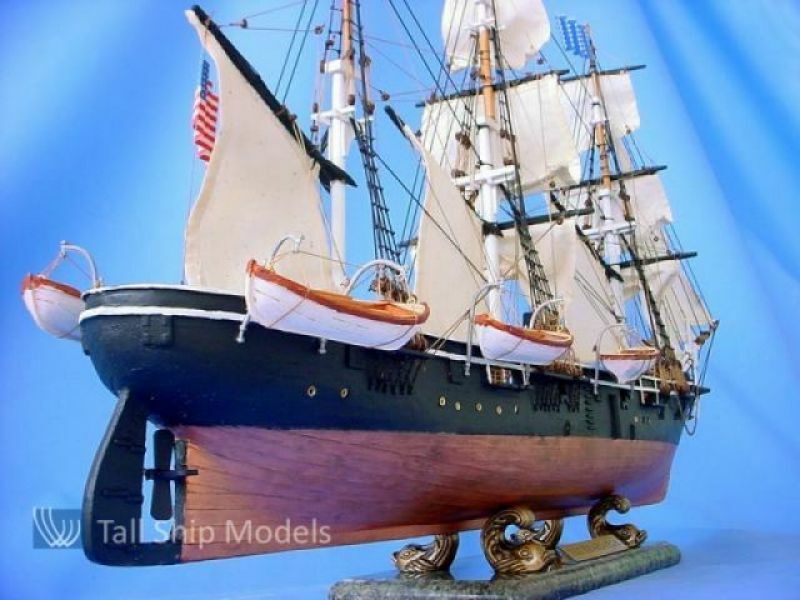 This Limited Edition tall model ship is certain to inspire with her patriotic history and indomitable spirit as the centerpiece of a den, office or meeting room, or perhaps setting a patriotic nautical tone in a corporate boardroom or family living room. Named for New Hampshire’s Mount Kearsarge, and built in the Portsmouth Navy Yard in Kittery, Maine the USS Kearsarge served with distinction during the Civil War, earning her crew Medals of Honor and herself a special place in history. 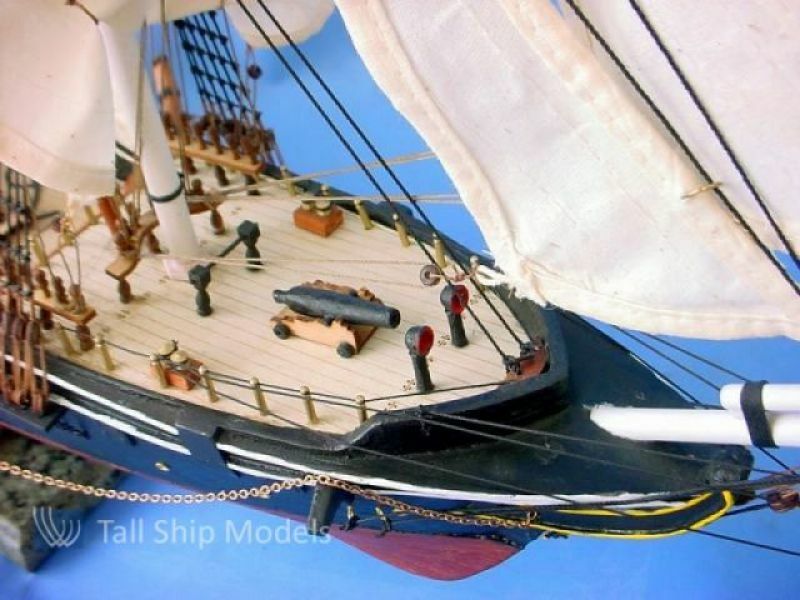 In 1861 the Union enacted the American Civil War Emergency Shipbuilding Program in order to bolster the North’s naval presence along the American and European coasts and stem the tide of Confederate raiders. 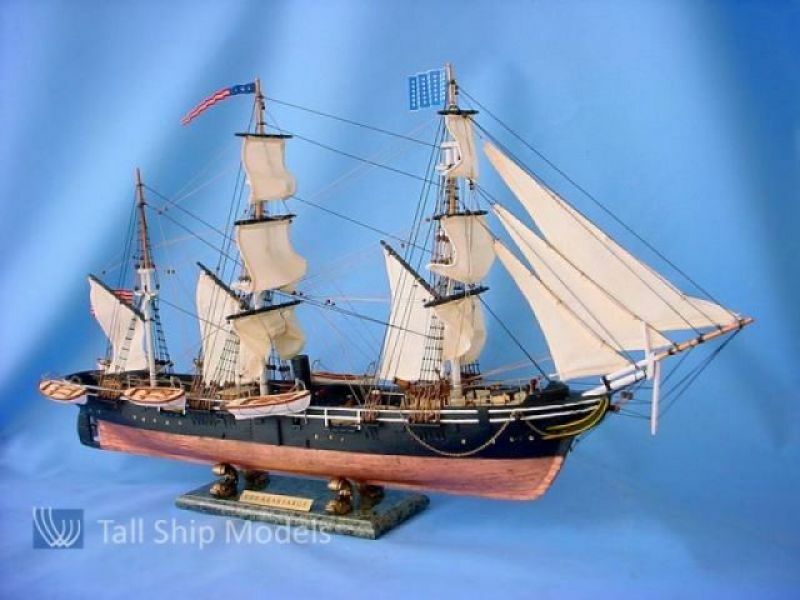 At 201 feet long, weighing 1,570 tons, and powered by a combination of sail and steam engine, the USS Kearsarge emerged as a menacing Mohican-class sloop-of-war. Launched on September 11, 1861 and commissioned Jan 24, 1862, the Kearsarge was commanded by Captain Charles Pickering as it departed across the Atlantic. 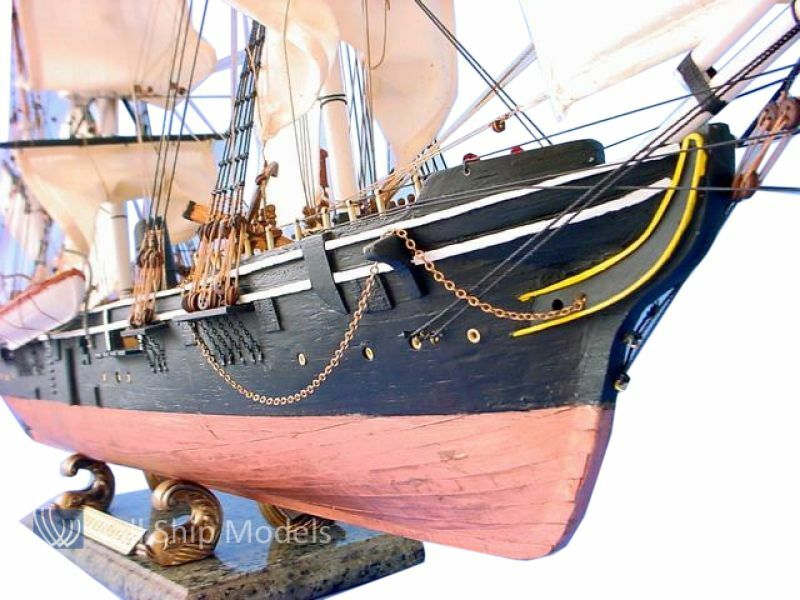 Departing from Portsmouth on February 5, 1862 Captain Pickering took the Kearsarge to the coast of Spain and on to Gibraltar, where she joined an active blockade of the CSS Sumter. 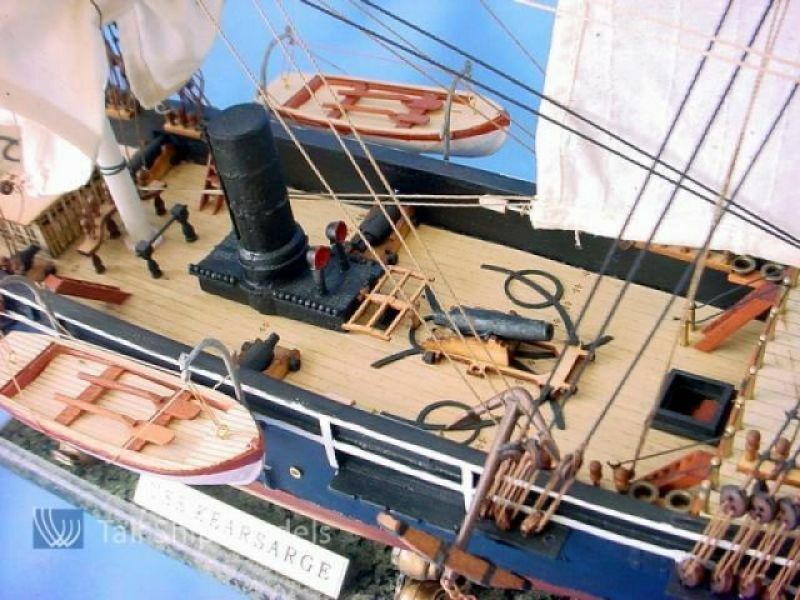 While this mission was one of her primary concerns, eliminating the Confederate raiders that had been so detrimental to Union shipping, it was a battle with the CSS Alabama that made the Kearsarge legendary. 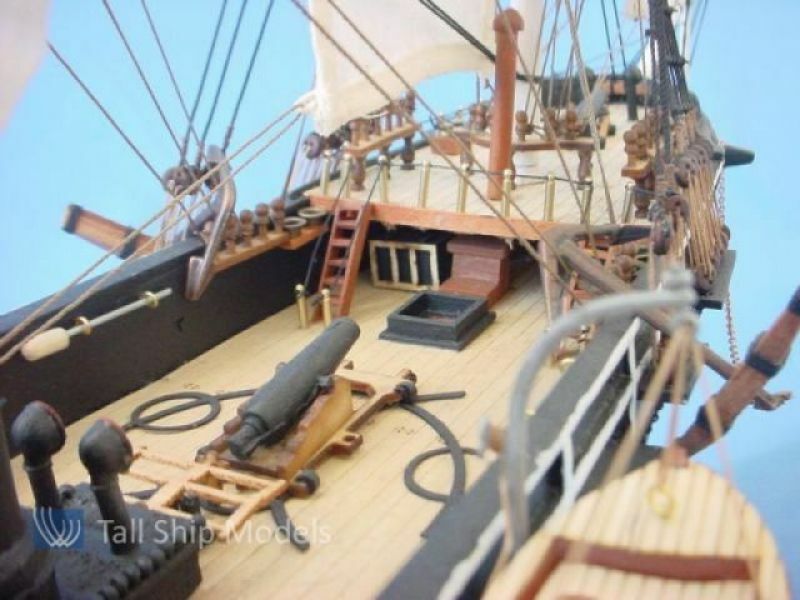 Carrying twin 11” Dahlgren guns, four 32-pound cannons, and one 30-pound rifle, the Kearsarge was a formidable enemy - one that the South would soon learn about first hand. As one of the prime Confederate raiders, the CSS Alabama had entered into seven successful raids across the world’s seas, making her a particularly enticing target for Captain Pickering. Learning that the Alabama was in close proximity, Captain Pickering sailed the Kearsarge from November 1862 to March 1863, cruising the length of the European Atlantic coast searching for his target. Stopping in at Cadiz, the Kearsarge reprovisioned and refueled, preparing for a historic duel. Arriving in Cherbourg, France on June 14, after a tip that the Alabama was very near, the Kearsarge took up a patrol pattern along the harbor’s entrance, preventing Alabama from any escape. 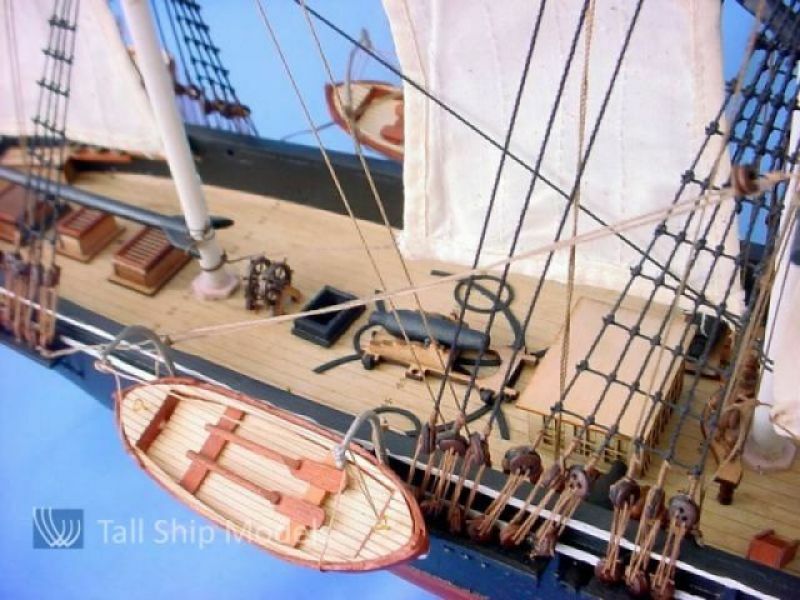 Realizing that his ship was trapped, Captain Semmes of the Alabama sent word to Captain Pickering requesting that the Kearsarge allow the Alabama to refuel and restock ammunition before entering into an honorable firefight. Ever the gentleman Captain Pickering consented, moving the Kearsarge into international waters and awaiting the Alabama’s entry. 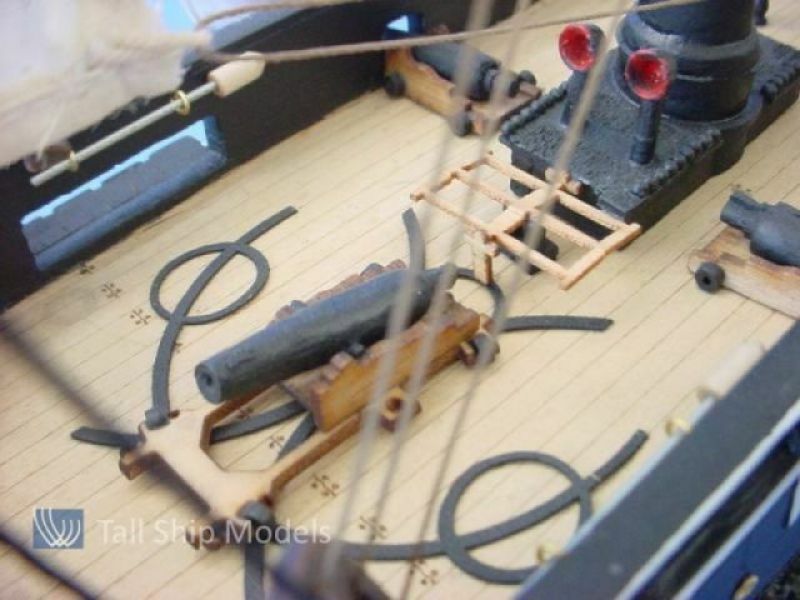 On June 19 the Alabama was restocked and ready to meet her fate, sailing out to firing range of the Kearsarge. Captain Semmes ordered his crew to open fire on the Kearsarge, perhaps prematurely, as the distance was too great to allow any accuracy. Waiting until the Alabama was in firing range, Captain Pickering began a slow circle at about 1,000 yards distance. 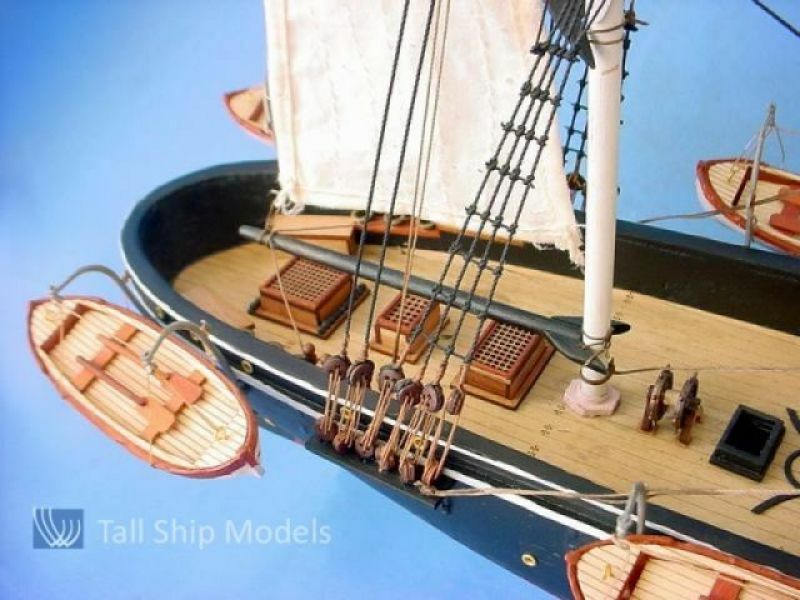 The two ships, each vying for a chance to cross the other’s bow and fire deadly raking shot, circled each other as the two captains issued orders to their crews. Though the Alabama continued to fire on the Kearsarge, there were two important factors that Captain Semmes was unaware of. The first was that much of Alabama’s artillery had been rendered ineffective after months of sitting aboard ship; the second, and more important, is that the Kearsarge was secretly armored. The year prior to battle, as the Kearsarge stopped over in the Azores, linked iron chains had been added to her hull like a suit of armor. Stopped in by eye bolts and secured with iron latches, or “dogs,” the iron link armor was a powerful deterrent to rifle and cannon shot. 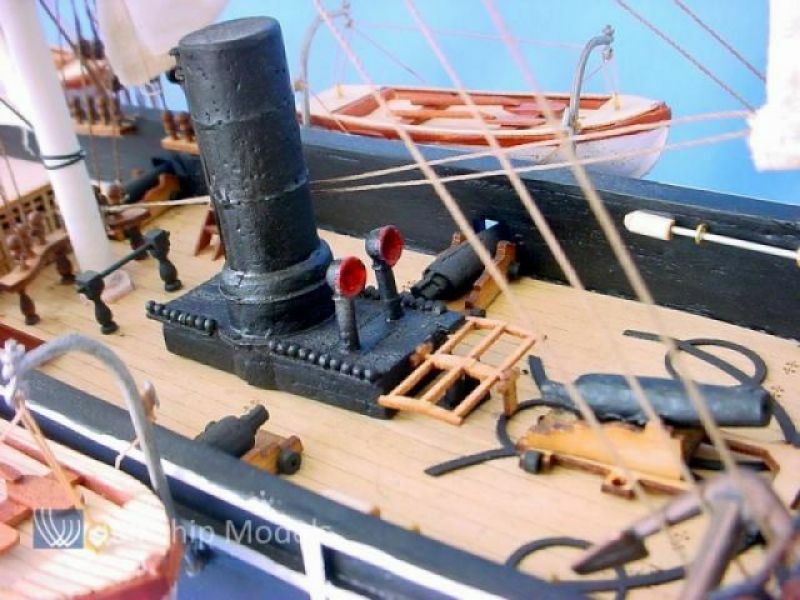 In a wonderful twist of early subterfuge, these iron chains were then covered by 1” thick wood boards painted black to match the Kearsarge’s hull. 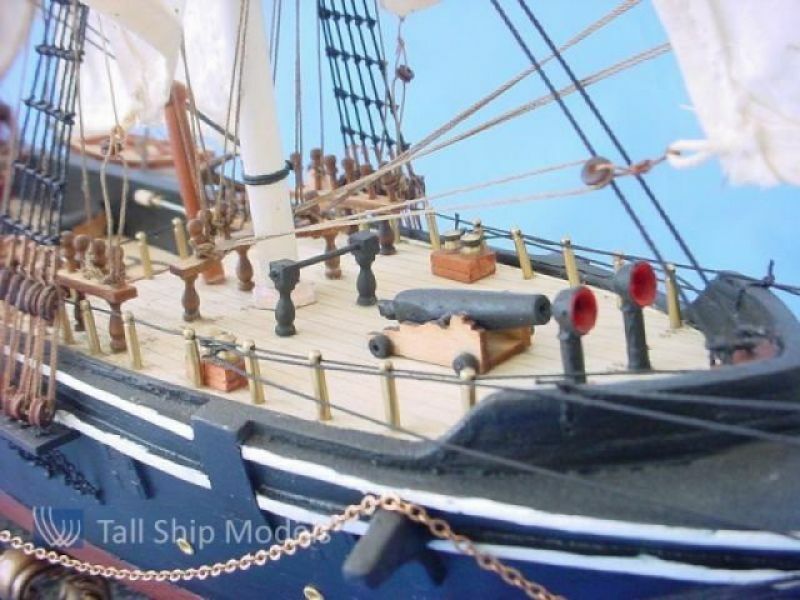 While Alabama made two direct hits on the Kearsarge, Captain Semmes thinking he had won the battle, the 32-pound shells had merely dented the hull. Responding in kind, Captain Pickering fired the twin Dahlgren guns and within an hour of the firefight’s initiation the Alabama was sinking. Though the Kearsarge rescued the majority of the Alabama’s crew, Captain Pickering was denied his enemy’s formal surrender when Captain Semmes absconded with his sword and 41 crew members aboard the British ship Deerhound. For her actions in stopping a prominent Confederate raider, 17 crew members of the Kearsarge received Medals of Honor, and the ship herself awarded a Battle Star. After her victory over the Alabama, the Kearsarge continued to patrol the European coast, searching for another Confederate raider: the CSS Florida. 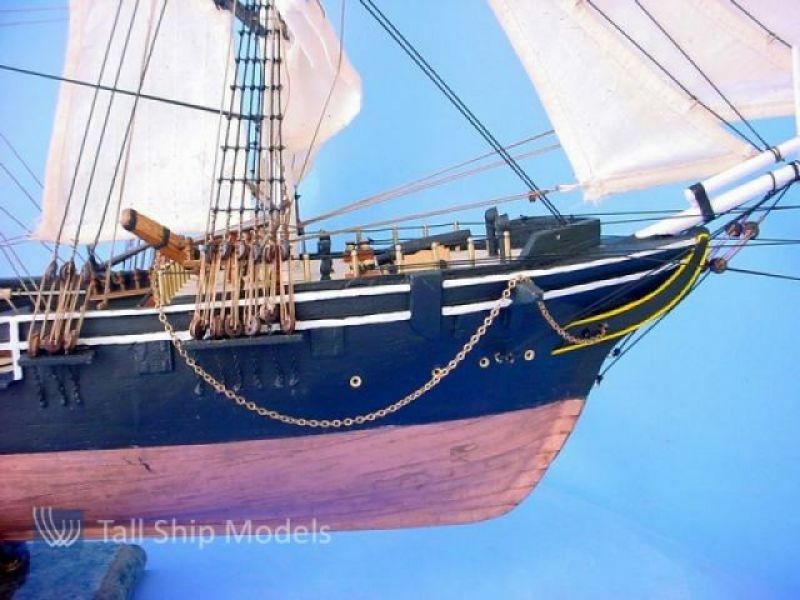 Unsuccessful in this venture, she sailed through the Caribbean en route to Boston where she was decommissioned for repairs. Recommissioned on April 14, 1865 the Kearsarge returned to Spain in an attempt to catch the CSS Stonewall on her last war-time mission. Returning to Boston Navy Yard unsuccessful, the Kearsarge was decommissioned as a military vessel and remained in that standard for the next year and a half. On January 16, 1868 she was recommissioned yet again, this time sailing to the South Pacific where she docked at Valparaiso, Chile. While protecting American interests along the Pacific Coast, the Kearsarge aided earthquake victims in Peru before sailing to the tiny islands of the South Pacific. 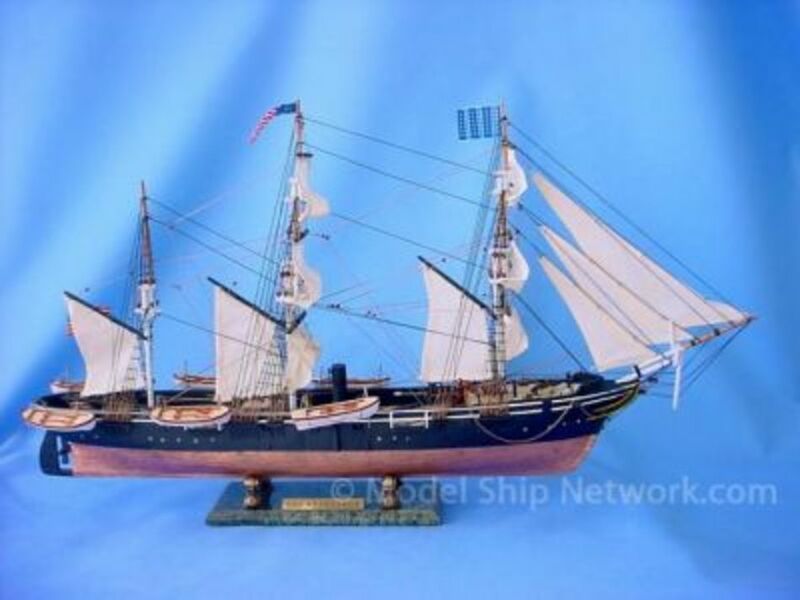 For the next year she would sail through the South Pacific, visiting the Marquesas and Fiji, making port in Hawaii, before being decommissioned on October 11, 1870 on Mare Island. Recommissioned again in the Pacific, in 1973, the Kearsarge was sent to the Asian Pacific Coast where she would sail protecting American merchant vessels throughout the seas of China and Japan. On her last mission in Asia she served on a scientific voyage, carrying Professor Asaph Hall and his team from Nagasaki, Japan to Vladivostok, Russia as the professor studied the Transit of Venus. Returning to Boston on December 30, 1877 the Kearsarge was once again decommissioned, repaired, and put to port. 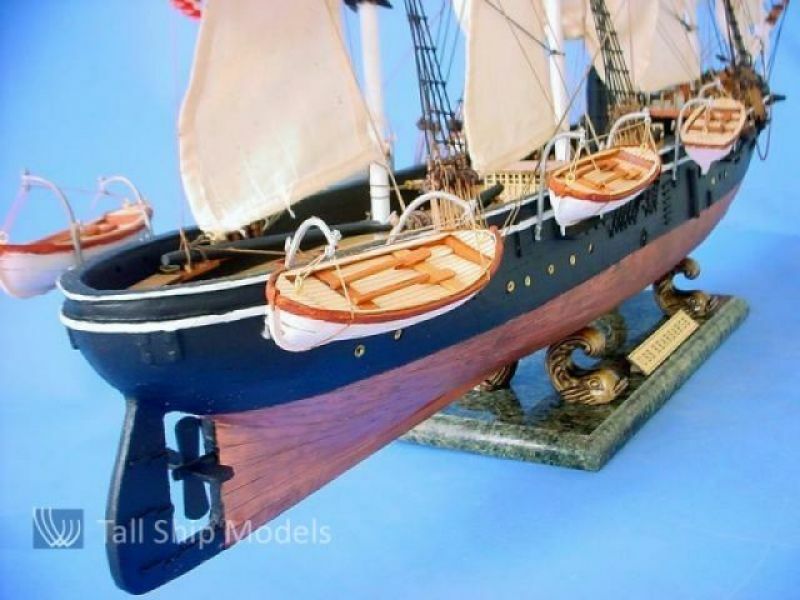 However, on May 15, 1879 she sailed once again through the North Atlantic before departing for the Mediterranean, Northern Europe, and the coast of Africa. 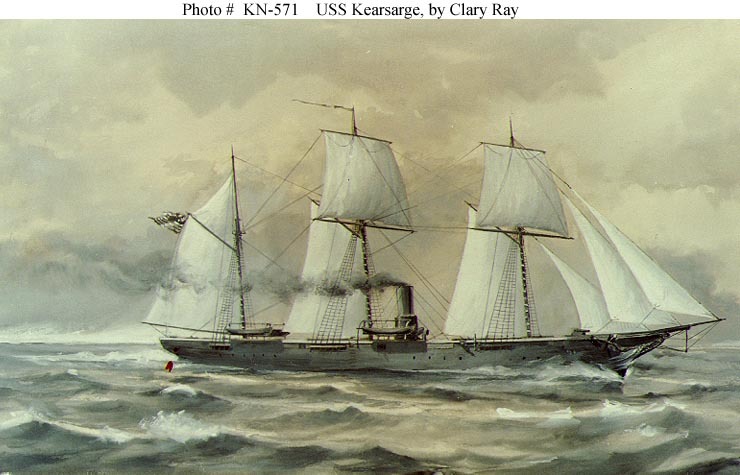 After returning to Portsmouth Navy Yard on December 1, 1886, the Kearsarge had one final sail left in her. 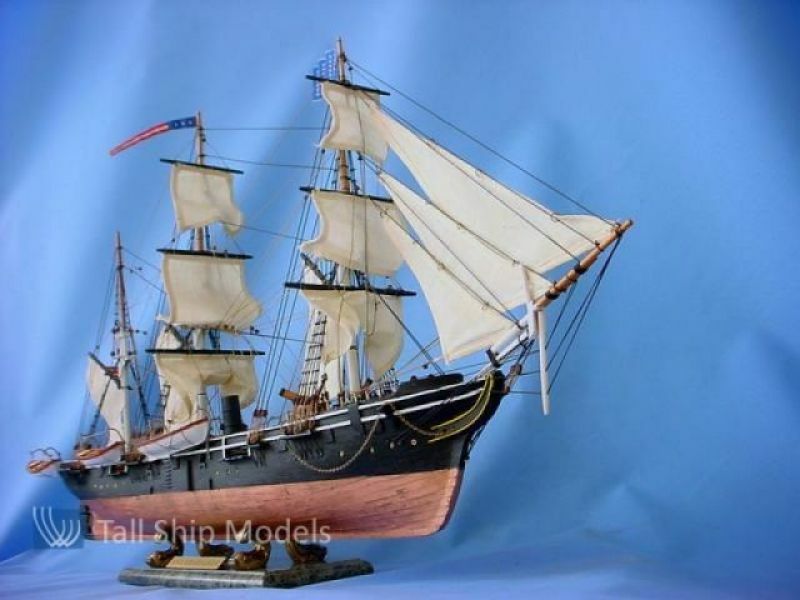 Sent to the West Indies in 1888 to patrol the Caribbean and Central America, she departed from Haiti on January 20, 1894 and on February 2 struck a reef off of Roncador Cay, quickly sinking in the warm tropical waters. Fortunately, with the close proximity to the cay, all of the crew and officers survived and made it to shore. Though the wreckage of the Kearsarge could not be raised, some artifacts were discovered including the ship’s Bible and a section of the stern, which can be seen at Washington Navy Yard. Aside from her historic battle with the CSS Alabama, the USS Kearsarge has also passed on her name to a number of warships that followed, including a second sloop of war built in 1898, a World War II Aircraft Carrier built in 1946, and an 844-foot WASP-class USS Kearsarge (LHD-3), which carriers both Harrier jets and amphibious assault squads.